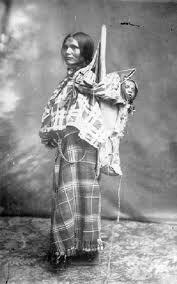 It’s the birthday of the Shoshone woman Sacajawea, born in Idaho sometime around 1789. She was kidnapped at age 10 by the Hidatsa tribe, sold into slavery, and bought by a French-Canadian trapper who made her one of his two wives. When Lewis and Clark hired the trapper to guide them to the Pacific, Sacajawea — a teenager with her two-month-old baby on her back — was part of the deal. She was the only woman to accompany the permanent party to the Pacific Ocean and back. Officially she acted as interpreter, since she could speak half a dozen Indian languages. But she also knew which plants were edible, and she saved the explorers’ records when their boat overturned. In his notes, William Clark pointed out that tribes were inclined to believe that their party was friendly when they saw Sacajawea because a war party would never travel with a woman, especially one with a baby.